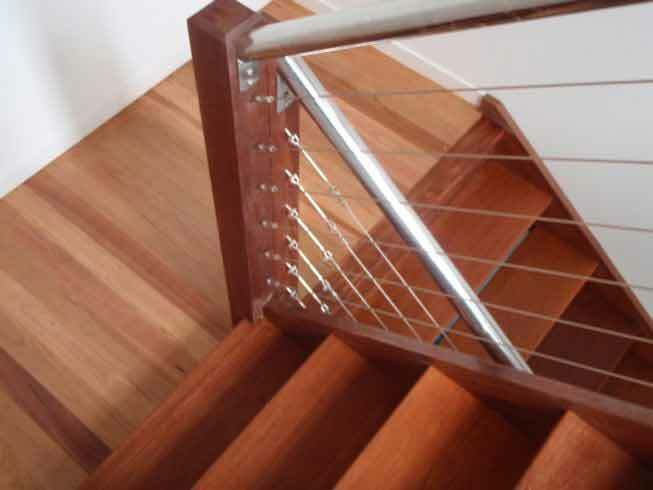 Your Brisbane polished timber stairs are the first thing people see in your home. After entering the front door, it takes center stage. With that in mind, you want them to look stunning! The restoration, and prep work involved with polished timber stairs is a tedious job. With stair components small in scale, it can be a little time consuming. That aside, when completed they can be a stunning addition to the entry of any property. The difference between sanding floorboards and sanding stairs, is dealing with multiple small scale components. It’s like preparing a fine piece of furniture for the coating processes. A successful polished timber stairs restore boils down to attention to fine detail. Removing old carpet to unveil a wonderful set of hardwood stairs is a client’s delight. They are evermore stunned when we perform our magic with them. After tearing up old floor coverings from an aged home there are sometimes a few surprises. There may be aspects which may need some extra attention. The quality of workmanship on some stairs may be less than perfect. These flights of stairs may have large gaps between the treads and uprights. In this situation we can fix into place timber quad trim plus stain it to suit the stair’s timber species. This approach presents well upon completion and offers a seamless appearance. The flow of foot traffic within a home will funnel from the foyer/hall and living areas onto the staircase. The stair treads will absorb the brunt of the wear. To be more precise, it is a small arc at the front of the stair treads which we tend to walk on when using the stairs. This means durability needs to be high when it comes to surface coatings. 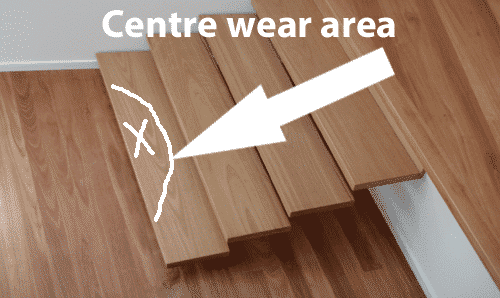 There is an anti-slip additive we can use on the treads of your polished timber stairs. The trade-off is that it only comes in a flat finish only. The ant-slip coating’s looks are deceiving. It’s a smooth flat finish to look at, although feeling it will reveal the anti-slip surface with a R10 Slip Rating. 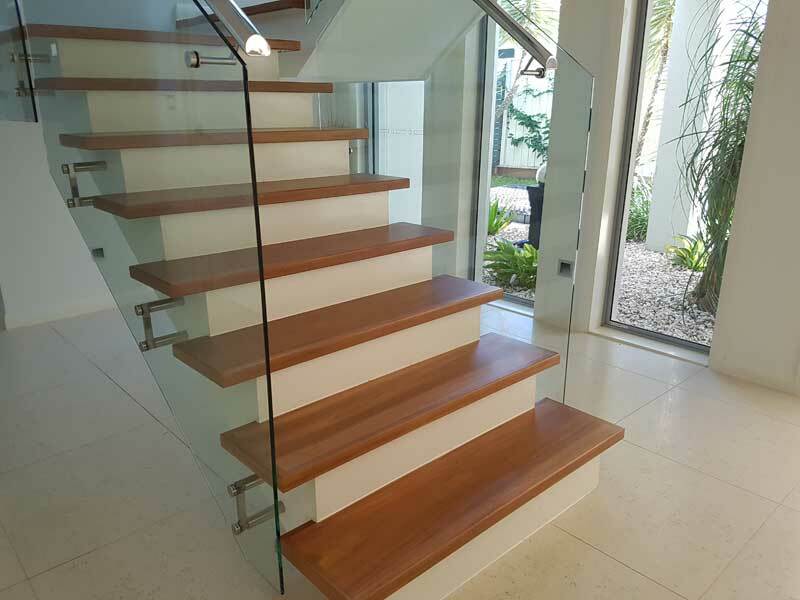 The anti-slip rating is compulsory for NEW timber stairs in Brisbane and Queensland. To clarify, that is for all stairs installed in new homes and extensions from 2014. It is currently not compulsory for staircases in existing dwellings. These building regulations became effective in 2014 by the Qld Government. The anti-slip coating may be a good choice if you are the landlord of a rental property with polished timber floors and stairs. If you have an existing home, you may consider the anti-slip coating for safety reasons. It would be most suitable for elderly occupants or children to help avoid an accidental fall. 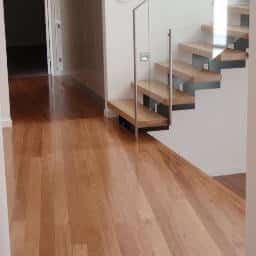 Talk to Economy Floor Sanding today about choosing a gloss level for your timber floors and staircase. We are your local Brisbane floor sanders and floor coating specialists.